Well, it’s been quite a while since I posted last and I’ve been getting lots of e-mails from you guys asking (nicely) what’s up :)! I’ll make this post loaded with lots of art and pictures since I have some making up to do. I haven’t been painting much lately because the house (we are building) is taking up all my creative time and energy. I may do some posts here soon to let you know a little bit about our house. 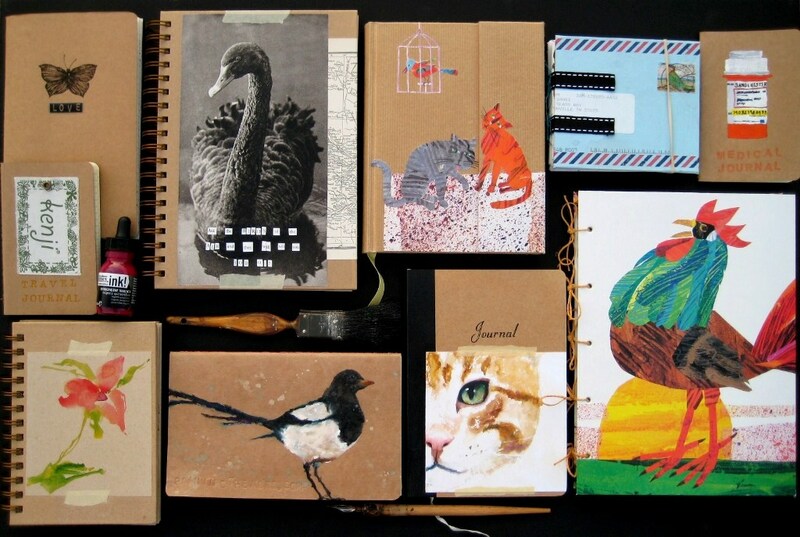 But this post is about handmade journals. Click on any of the journals to see them larger. 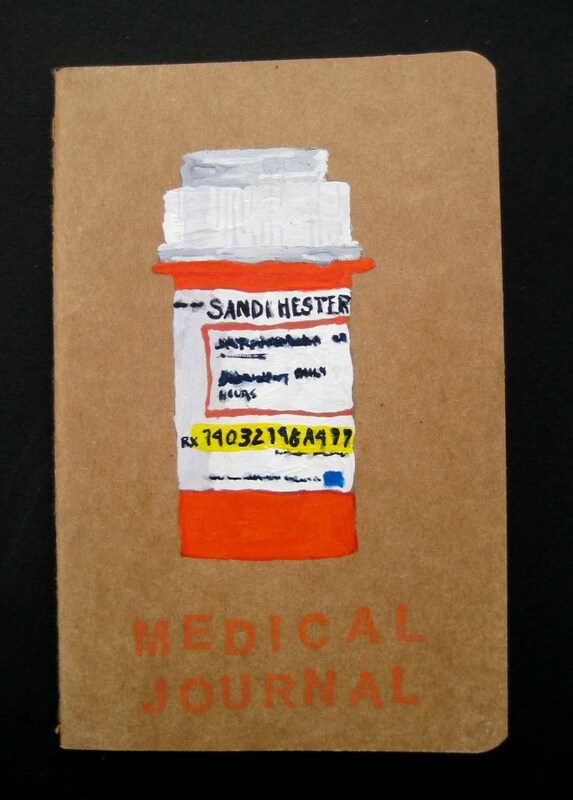 One day I was drawn to the beautiful orange color of my prescription bottle and I decided to paint it. I had a small 5x3 plain journal that I thought I'd make into a medical journal – we don’t really use it but it sure is cute! I LOVE journaling – I keep prayer journals, sketchbook journals, travel journals, and any other kind of journal that comes to my mind. Because journals are expensive I like making my own sometimes. Here’s just a small sampling of some of the journals I’ve made since we’ve been renting (I’m sure I have more than this they are just packed up). I use ALL kinds of methods when making my journals. Sometimes I use plain journals I’ve bought at a store and add my own art work to the front. Others I use pages torn out of old books I find at a local used bookstore and apply them to the front and back covers. I use all kinds of books – children books, animal books, dictionaries – anything that draws my attention and is cheap! 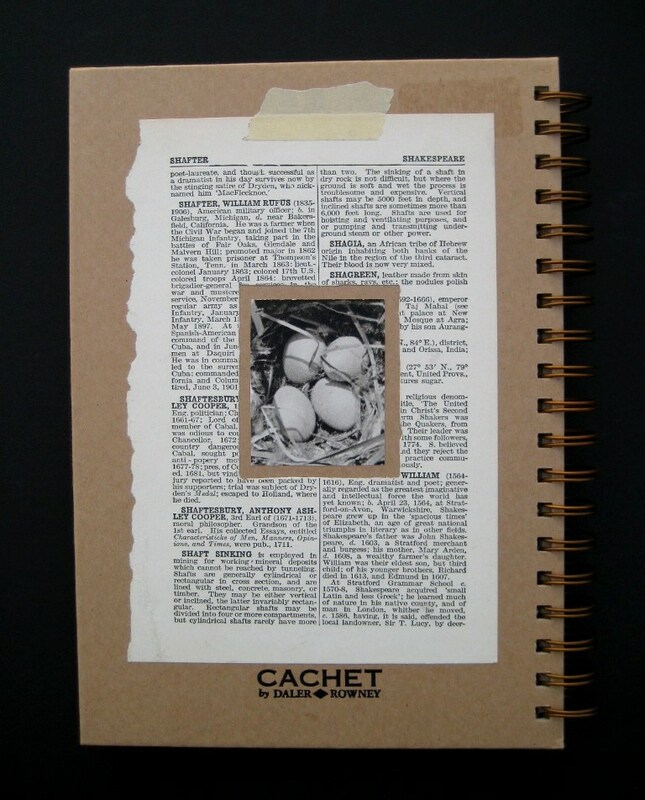 I just apply the torn pages with glue – sometimes I add tape over the picture because it has a look about it I like. Front cover of a journal I hand bound with hand torn watercolor paper. I used the opposite page in the book and it created a fun front and BACK cover. 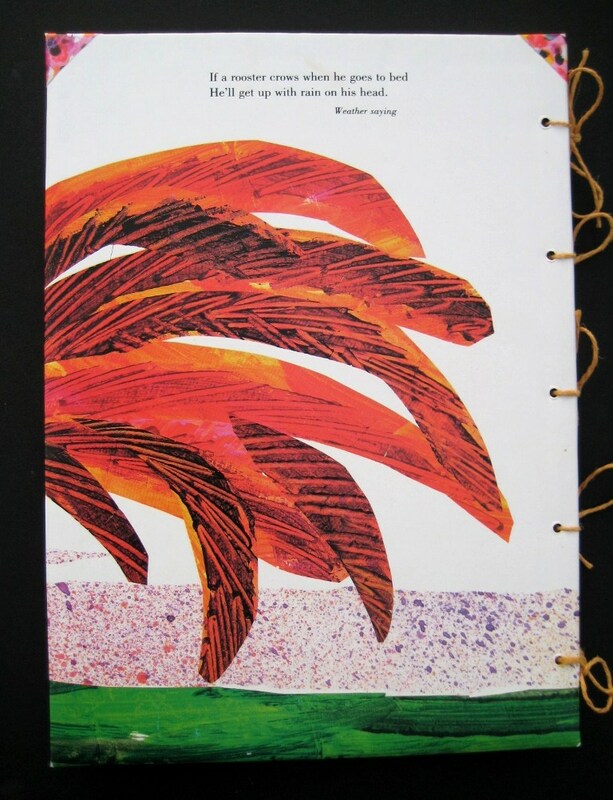 This is a color chart journal I hand bound with hand torn watercolor paper. I covered cardboard I cut from a box lying around with two pictures from a children’s book. The pictures made fun front and back covers. 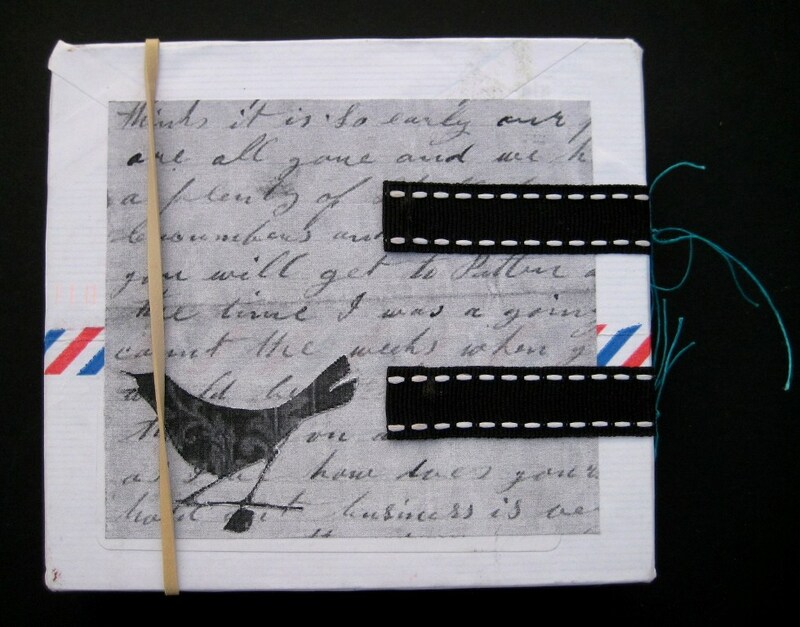 I just punched holes in the cardboard covers and the paper and tied with ribbon – very easy! This next one I took pictures from an old bird book and dictionary. I layered the pages and then cut out letters from another used book to form the scripture for the cover. I wrapped the map around the cover so it would show on the inside cover. 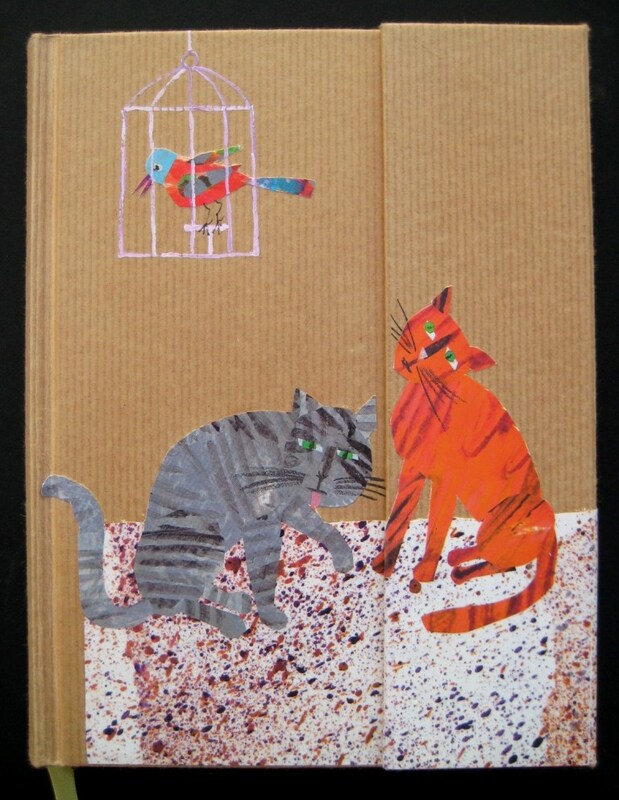 There were lots of pages I wanted to use from the bird book so I decorated the front and back cover (inside and out). 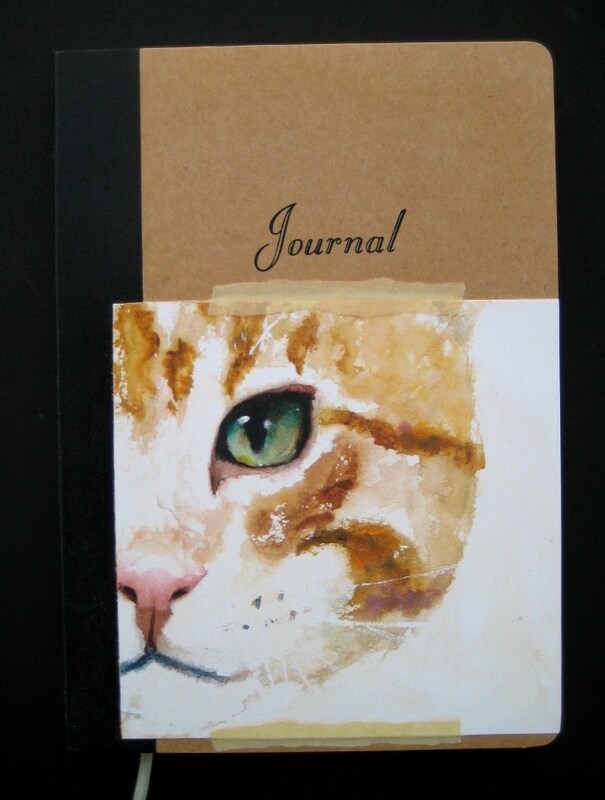 This cute kitty cat journal I made from one of my own paintings. I really liked the painting and tried a new printer to make some prints but they weren’t up to my standard. I couldn’t use the prints to sell but I sure didn’t want to throw them away – so this is one way that I reused a “throw away” print. I just cut it out and glued and taped it on a plain journal. 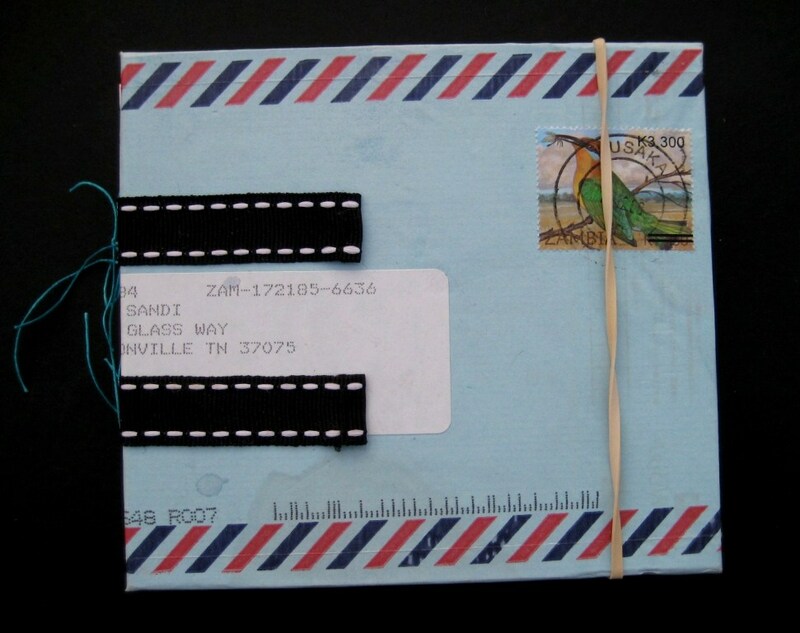 You could do this with kid’s art, junk mail, or just about anything! Here’s a small one (about 5×5) I made (again I think I just used cardboard as the base for the cover) and I covered it with an envelope from a friend in Africa. I loved the color and the stamp. I used scrap pieces of ribbon to connect the front and back cover and a simple rubber band to keep the book closed. 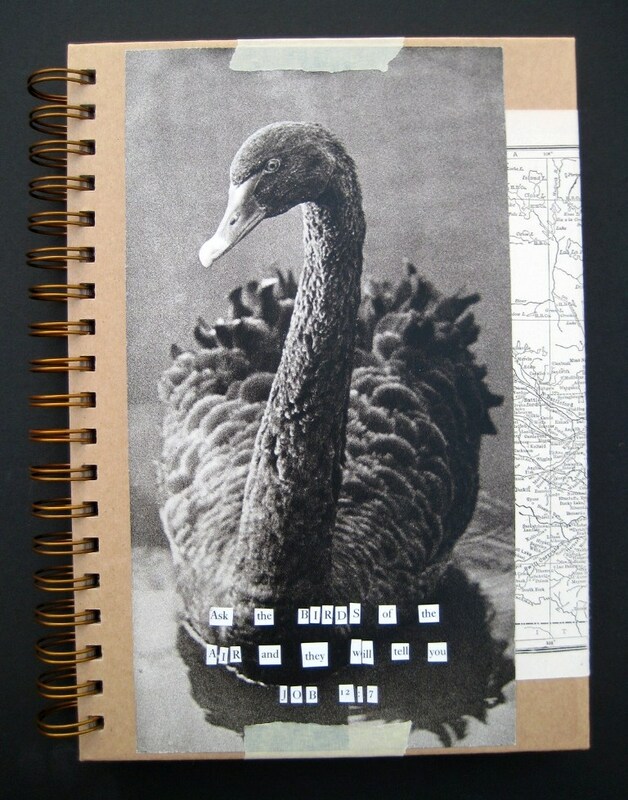 For the back I used some black and white photo copies of some writing and bird. I have a box I keep in my art room where I throw any kinds of scraps, stickers, paper, envelopes, pictures, etc for use on things like this. I am constantly digging through that box using scraps for things. This last one is﻿﻿﻿﻿ one of my favorites and it was very simple! 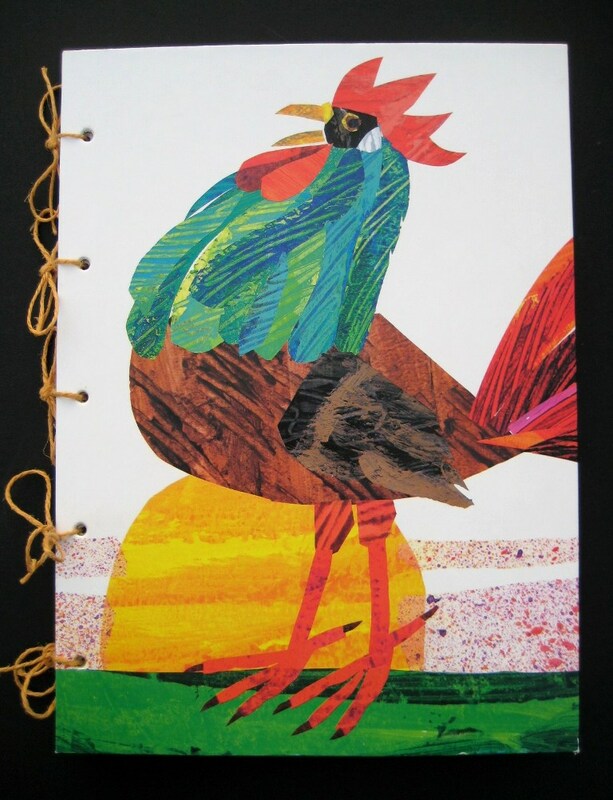 The cats and birdie were cut out of the same children’s book as the rooster above and glued onto the journal. I painted the little bird-cage around the birdie because I thought he’d look cute just hanging above the cats. 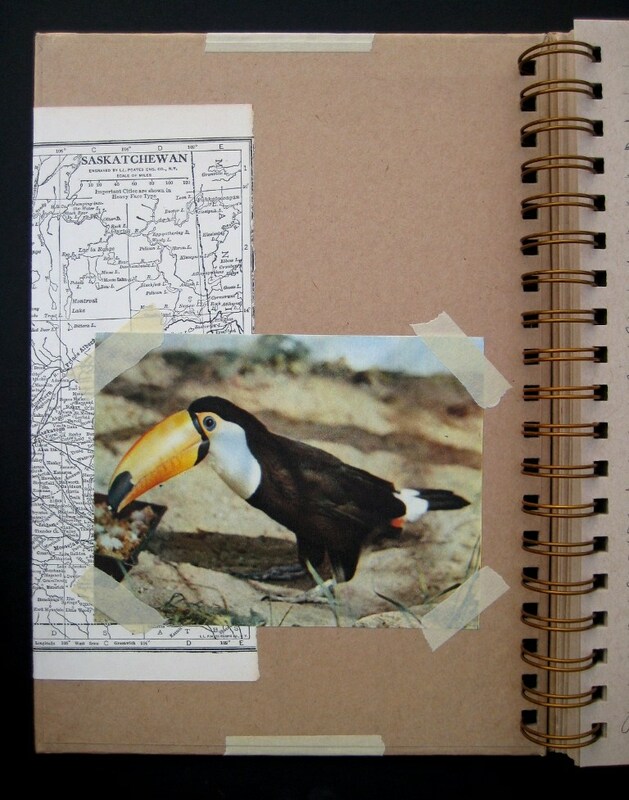 Here’s just a little look ﻿into another area of my art work and life of journaling. ﻿Wow – that may have been my longest post ever and it took me FOREVER because I’m quite rusty on posting. Hope to be back on here soon to share some of what we’re doing with our new house! Awesome! Where are you guys now? We are still in Hendersonville renting right now but this spring or early summer we’ll be in our new house. We have joined an AWESOME church in Joelton called Charity Baptist and are loving it!!! Hope you guys are doing well!